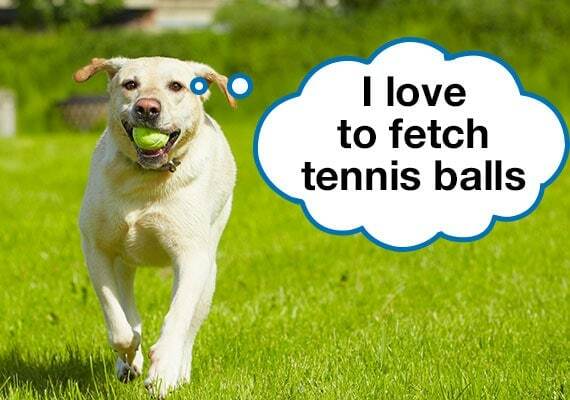 It’s no secret that dogs love tennis balls. The small, flexible shape makes them easy to carry by dogs of all sizes. Owners love them too. 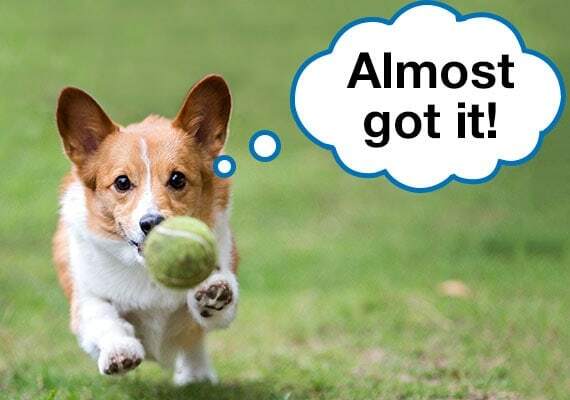 When I’m at my local dog park, I see dozens of owners playing fetch with tennis balls – they are the perfect size for throwing. I would go so far as to say that tennis balls are one of the most popular dog toys around. However, it might surprise you to learn that your dog’s favorite play toy could be harmful to his health. But don’t worry because we have you covered! We spent over 100 hours testing and reviewing 30+ different tennis balls, playing hundreds of games of fetch using both a ball thrower and our arms until we were pooped, day after day. Which tennis ball is best for your dog? So, join us as we explore what makes tennis balls so dangerous to dogs and the dog-safe alternatives you should be using instead. Why are tennis balls dangerous to your dog? What is a dog tennis ball and does your pooch need one? 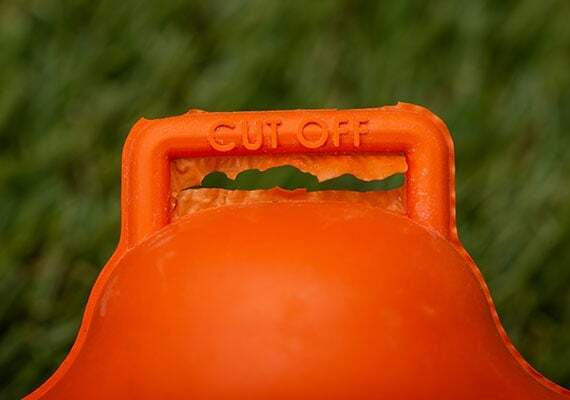 As I touched on earlier, this popular dog toy can quickly become deadly. Before we look at dog-safe tennis ball alternatives, let’s take a closer look at why that green, fuzzy ball is so dangerous to your dog. Let’s start with the biggest threat… Choking. When you squeeze a tennis ball in your hands, you notice it has a little give, right? Now, on its own, this isn’t an issue. However, if a compressed ball moves to the back of your dog’s mouth, it can pop back to full size and block your dog’s airway. This is a particular problem for bigger dogs. The larger mouth gives more opportunity for the ball to work its way to the back of the throat – especially if your dog grabs more than one tennis ball at a time. It’s more common than you think. Every few months, you come across a news report of a dog that was rescued from choking on a tennis ball. Large dogs are more than up to the task of swallowing a tennis ball. If you have a Labrador, you know exactly what I mean. The strong jaws of these dogs can crunch a tennis ball in a single bite. Some dogs, in particular, love the challenge of trying to break a tennis ball. A broken tennis ball can be swallowed, and the pieces are sharp enough to do serious damage to your pup’s organs. Actress Mandy Moore’s dog recently swallowed a tennis ball and had to undergo emergency surgery. While most tennis-ball-swallowing incidents are not as newsworthy, I found many reports online from other dog owners who had similar experiences. Smaller dogs are at risk too. Those sharp teeth can easily tear and peel the green fuzz off a tennis ball. If your dog eats this, it could lead to choking or even intestinal blockage. At first glance, a tennis ball feels soft. Well, check out what happens if you rub it up and down your arm with moderate pressure. Feels like sandpaper, right? Yep, tennis balls are much more abrasive than you think. And it gets worse. With continued use, dirt, rocks and sand become trapped in the fuzz, making it even more coarse. 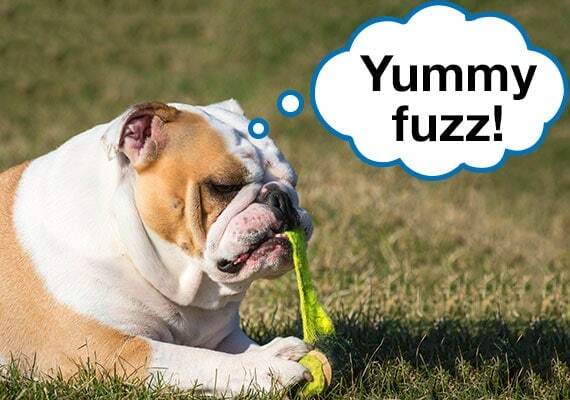 When your dog clamps down on a tennis ball, the fuzz rubs against your dog’s teeth, wearing them down. Over time, this could lead to severe dental issues. 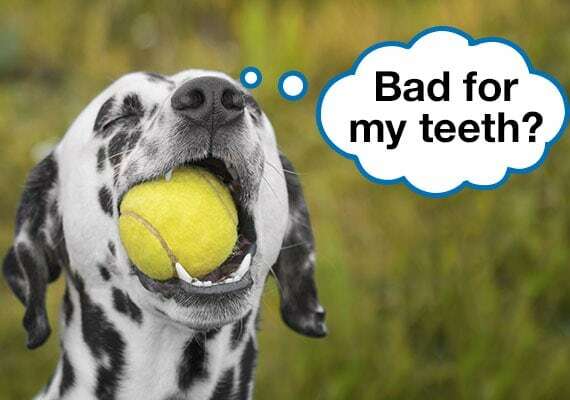 Exactly how bad tennis balls are for dog teeth is debated among veterinary specialists. Some say that unless your dog is a ball fanatic and chews for hours at a time, you probably don’t need to worry about dental issues. But when combined with the previous concerns, it paints the picture of a dog toy that should be used with caution. Will a tennis ball kill your dog? Probably not. But the above dangers are real. At the end of the day, tennis balls are designed to be hit around a tennis court, not chased or gnawed on by your dog. Considering the wide availability of dog-proof tennis balls, I see little reason to go back to a traditional green-fuzzy one. And, they are the ball of choice in games of fetch! A dog tennis ball takes all these elements and improves on them in every way. When it comes to supervised games of fetch, a green-fuzzy tennis ball just doesn’t compete. Now, you could argue that if you take away the green fuzz, then these are no longer tennis balls. I agree with you. But to keep things simple, I refer to these as dog tennis balls throughout the rest of the review. Dog tennis balls have been specifically designed for dog use. They can be thrown farther, bounce higher, are easier to clean and hold up to sharp, pointy teeth. You might look at the cost of these dog-safe tennis balls and turn up your nose. I get it! For the same price, you could buy bulk tennis balls from your local dollar store. But what you are paying for is safety. As I covered above, tennis balls are not designed for dogs and can be harmful in certain cases. For many of you, the small extra cost will be worth the peace of mind. 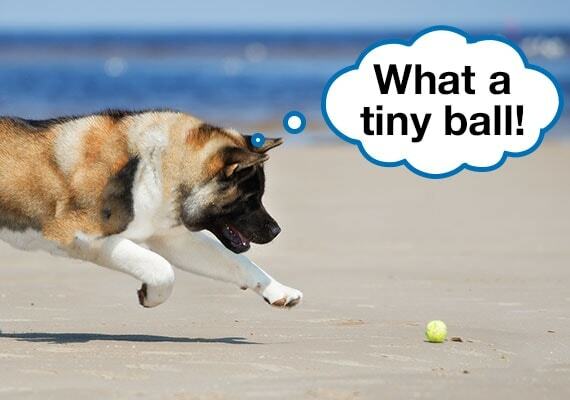 Because dogs come in all different shapes and sizes, so do dog tennis balls. Ranging from 2 inches for small dogs, like Dachshunds and Yorkies, all the way up to 4 inches for Saint Bernards or Alaskan Malamutes – there is something for all dogs. And yes, before you ask, these balls can all be used with your favorite ball thrower. Balls that measure 2½ inches, which is similar in size to a tennis ball, will fit just fine in a medium ball thrower, the most common variety. Be mindful that if you choose a smaller or larger ball, then you will have to buy a specific ball thrower to suit – or throw it the old-fashioned way, giving your arm a workout! Certain brands go a step further and offer specialized features that enhance the game of fetch. 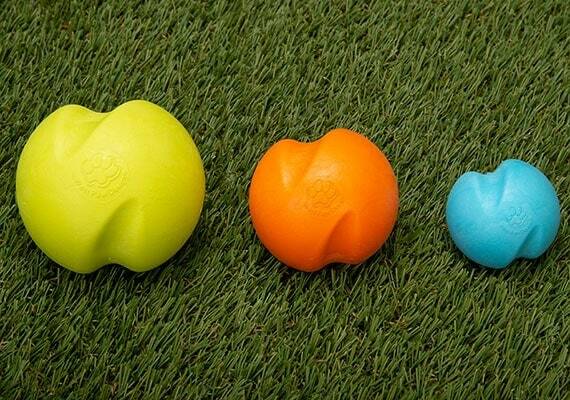 Does your pooch need a dog tennis ball? In my opinion, the only owners who wouldn’t benefit from a dog tennis ball are those who don’t play fetch with their pup. If this is you, then spend your money on a different toy, such as a tug-of-war toy. But for those who play fetch, whether in an open grassy field or the corridor of your home, a dog tennis ball is a substantially better option than a regular tennis ball. Decided that a doggy tennis ball is the right toy for your pup? Awesome! 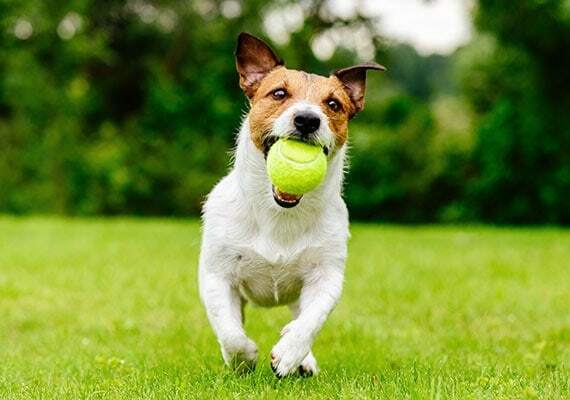 Now, all you need to do is check out these top performers to choose the best dog tennis ball to play fetch with your pooch! In our hunt to find the best, we tested and reviewed over 30 different dog tennis balls. It was a long journey, throwing ball after ball until our arms grew tired. But after 100+ hours of testing, we narrowed down the competition to 6 winners – each unique in their own way. To start, I show you the best dog tennis ball for most dogs. From there, I make recommendations for those looking for something a little more specialized, such as a tennis ball that bounces randomly when it lands, a heavy-duty design for power chewers and another that whistles when you throw it. 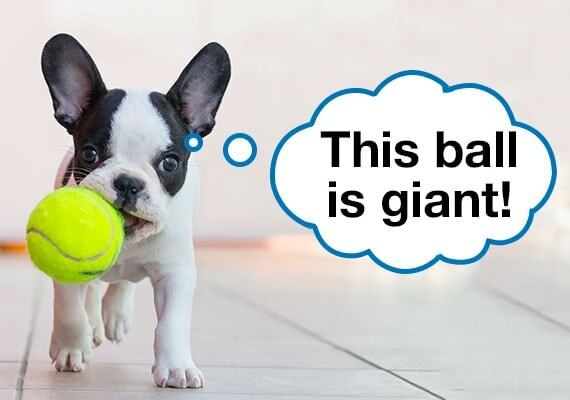 A bouncy, durable tennis ball for dogs of all sizes. 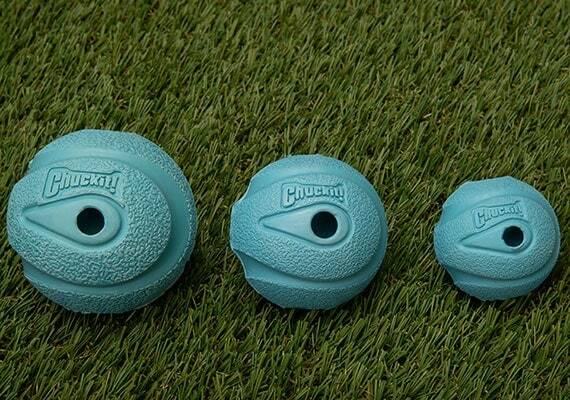 Out of all the dog tennis ball alternatives I reviewed, the Chuckit! Ultra Ball is by far the most popular. And I’m going to be straight up… That popularity is well-earned. For the price, quality and performance, it’s the gold standard of tennis ball alternatives. Chuckit! claims that their Ultra Ball can be thrown farther and bounce higher than a regular tennis ball. After testing with hundreds of throws with and without a ball thrower, I can confidently say they are correct on both accounts. This ball is slightly heavier than a tennis ball, allowing it to travel a longer distance when thrown. And being rubber-surfaced instead of green-fuzz, it certainly bounces higher. The higher bounce is much more noticeable on hard surfaces than on grass. The rubber on the outside also held up considerably better when compared to a regular tennis ball. Our hard-chomping Labrador broke three tennis balls throughout our testing. The Ultra Ball fared much better with just a few teeth marks to show. Being hollow, these balls float in water. 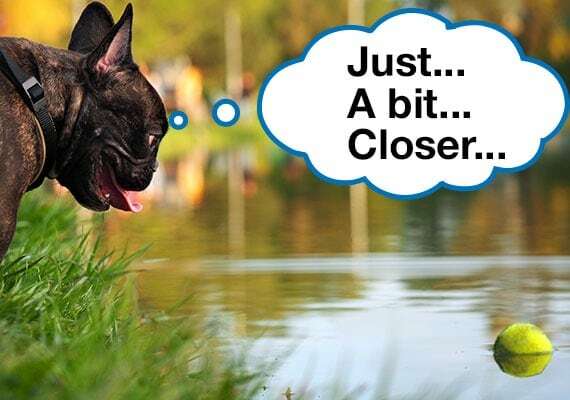 If it bounces in your pool or a wayward throw ends up in a river, it’s easy to fish out. If your ball thrower holds a regular-sized tennis ball, then the medium (2½ inches) will slide in perfectly. The other sizes are good if your pup is on the extremes of dog breed sizing. Since there is no fuzz for smaller dogs to grip, I recommend sizing down. I found Chihuahuas could just get away with a small, although even that was on the verge of being too big. And, that’s all there really is to it. The Chuckit! Ultra is reliable. For the price, nothing else comes close. If you are looking for a fuzz-free tennis-sized ball to play fetch with, this is your best bet. Note: While the Chuckit! Ultra held strong during our testing, there are reports online that suggest the seam can split or a circular hole can form. This appeared to be a particular problem when used by powerful-jawed dogs like Pitt Bulls or Staffordshire Terriers. While I was unable to replicate this, if your dog is an aggressive chewer, then my next recommendation may be more suitable. A heavy-duty ball that holds up to even the most powerful jaws. Some dogs play rough. Take our Pit Bull tester, Petal, for instance. Every time she catches a thrown tennis ball, she spends the next few seconds aggressively shaking and biting the ball with her mighty jaws. Once she is satisfied that her catch is “dead,” she returns the ball, ready for it to be thrown again. 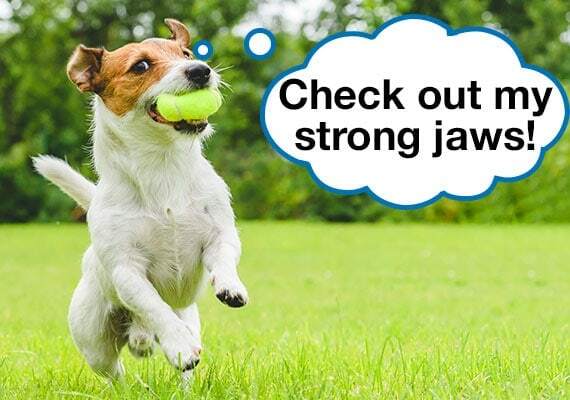 If your dog is a power chewer that likes to tear up tennis balls, then the Jive by West Paw will make it through your game of fetch without being crunched to pieces. The Jive is made from an FDA-compliant heavy-duty rubber that is free from nasties like BPA and latex. But the main reason it won this category is because of its durability. The rubber has a very slight give and wears incredibly well. 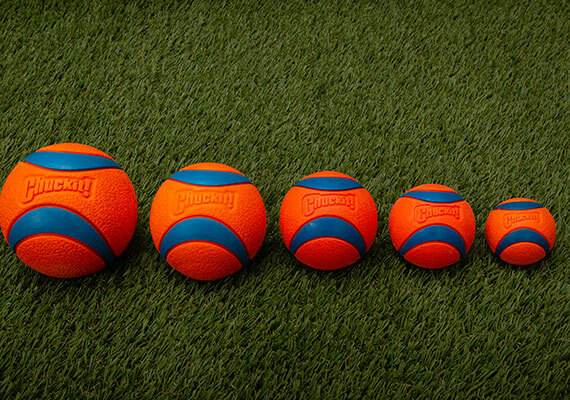 Over the course of testing, our ball only showed slight scuffs and scratches – and our dogs weren’t gentle! As you would expect from a sturdy toy, the Jive weighs considerably more than your ordinary tennis ball. If you bounce it indoors, it will hit the ground with a loud clunk and is heavy enough to break a window or other fragile items in your home. Therefore, I only recommend this ball for outdoor use. The small is about the same size as a regulation tennis ball and fits in a standard-sized ball thrower. Another great feature is that this ball is a little unpredictable. If you look closely, you notice that the Jive Ball isn’t completely round. Instead, it has small sections that protrude out. Depending on how the ball lands, it can bounce in a completely different direction. Our dogs appeared to love this unexpected surprise because the ball would change directions mid-throw. I admit that this ball is on the expensive side. For the same price, you could purchase four of my top pick. However, you get more for the cost than initially meets the eye. First, the Jive is made in America. In Montana to be exact. That in itself is worth a few extra bucks. Then, there is West Paw’s guarantee. If you don’t love this product, then West Paw will offer either a refund or let you choose another product in their range. Honestly, you have nothing to lose by buying this ball! While the West Paw Jive holds up to games of fetch, it isn’t appropriate as a dedicated chew toy. 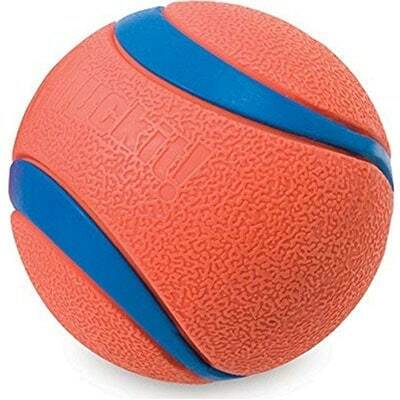 If you let your dog work on this ball for hours, then your dog will eventually puncture and break it. But for supervised games of fetch, it will provide entertainment for even the strongest of jaws. 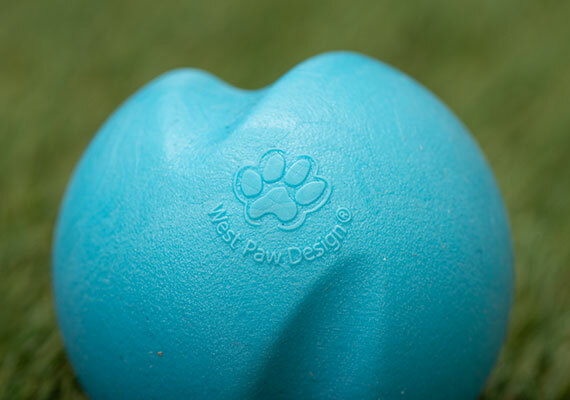 If you have a dog that plays rough or are happy to pay a higher price for a premium dog toy made right here in the USA, then there is a lot to love about the West Paw Jive. The open lattice-work design allows for easy breathing even through frantic games of fetch. Admittedly, I didn’t plan for there to be a best dog tennis ball for flat-faced dogs category. But after seeing just how difficult Jasmine, our Pug tester, had with regular dog tennis balls, I felt it was necessary. Jasmine has enough trouble with a regular-sized tennis ball at the best of times. Every time she tries to pick it up, her snout pushes it farther away. This made games of fetch really easy on my part, though! I only had to throw the ball once, and it took a good few minutes before she could retrieve it – usually by cornering the ball against a wall. But it was when she brought the ball back that I noticed something – the excessive wheezing and huffing. Don’t get me wrong… Jasmine ordinarily wheezes through her mouth when sitting still. But with a ball in her mouth, it sounded exceptionally strained. If you have a squashed-face dog, such as a Pekingese or French Bulldog, you might notice the same. This excessive wheezing was noticeable in all except one ball… The Chuckit! Breathe Right. The Breathe Right ball allows your dog to breathe easily even when his jaws are wrapped around a ball. It achieves this by its hollowed-out, lattice-work design. 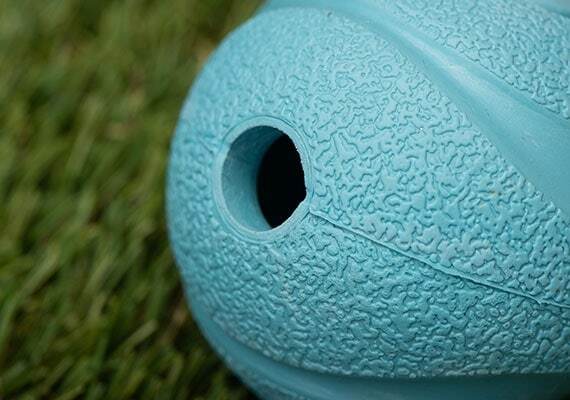 No matter how your pup picks this ball up, there is an unobstructed path that your dog can breathe through. I also noticed this ball got a little less slobbery than the other tennis ball alternatives I reviewed. I suspect this is because Jasmine could pick the ball up by the edges without needing to shove the entire thing in her mouth. The medium was the perfect size for our Pug tester since she could grab the edges. I wouldn’t recommend the small size for anything other than a toy breed. While Chuckit! also makes larger balls, I don’t recommend them. The balls are lightweight, and a Boxer or larger Bulldog could chomp through them in no time. While I didn’t have a large flat-faced tester on hand, I base this on the fact that our rowdy Labrador quickly crushed the large size. Small dogs only. It’s also worth mentioning that you can stuff treats in the ball’s holes. As you can imagine, this was our Pug tester’s favorite part. She would roll the ball all around my living room as she attempted to remove the treats from inside. While the Breathe Right won’t replace your go-to treat dispenser, it’s a handy feature that you can take advantage of. Now, the obvious drawback to this open design is the throwing distance. The lighter weight and open design just didn’t go as far, even when used in a ball launcher. For our Pug with small, stumpy legs, this shorter distance wasn’t an issue. It also made this ball more appropriate for indoor play. For small dogs obsessed with fetch, particularly those with squashed faces, then this is the dog tennis ball for your pup. A heavy-duty ball made from natural rubber that changes direction when it bounces. The term erratic ball covers any ball that changes direction when it bounces. The result is an unpredictable chase for your dog – he has to change directions as he races after the ball that randomly bounces left and right. It’s perfect for tiring out high-energy dogs and puppies! Erratic balls are not perfectly round like a regular tennis ball. Instead, they have protruding sections or flat areas. When the ball lands on these areas, the result is a change in direction. As you might expect, the unpredictable bounce of these balls means that they are unsuitable for indoor play. As I found out during testing, the definition of erratic varies from brand to brand. The Chuckit! Erratic Ball, for example, only slightly varied off course when thrown. The surface also had an impact on how random each bounce was – harder surfaces resulted in a more drastic change of direction. When it came to random bouncing, no ball compared to the Crazy Bounce by SodaPup. 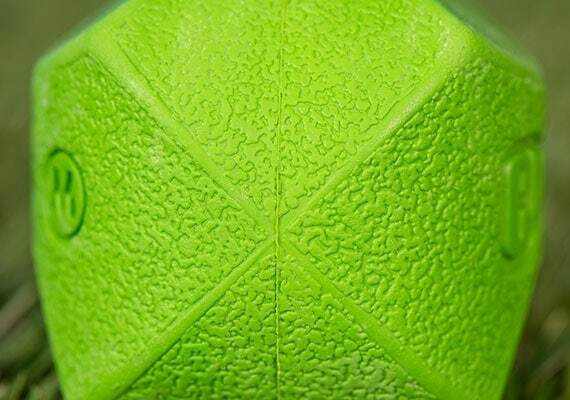 With its six protruding nubs, it’s a lot lumpier than your traditional tennis ball. On one side of the ball is a small tab, but I cut this off with scissors before play. Our Doberman Pinscher tester was infatuated with the way this ball bounced and wobbled around the ground as if it were alive. However, keep an eye on the ball because our tester lost track of the ball a few times as it bounced back over his head in the opposite direction. After I reviewed all the different erratic balls, I concluded… They are unsuitable for older dogs or those with hip problems. After watching our dogs frantically change direction mid-run to keep up with the ball, I believe it would be straining on senior pooches. I’ll also add that the solid rubber design is surprisingly heavy, especially when compared to a traditional tennis ball. 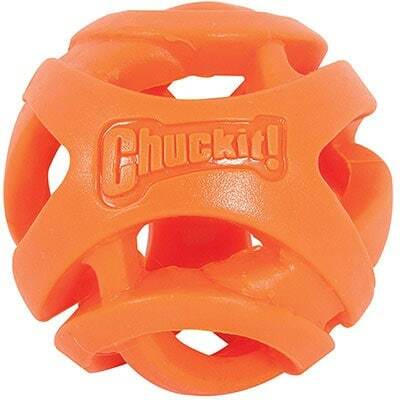 If you have a smaller dog, such as a Chihuahua or Pomeranian, then this ball is likely too bulky. On the flipside, this dense design is perfect for dogs that don’t know their own strength. Our tennis ball popping Labrador, and even a Great Dane puppy at the local dog park that wanted to join the fun, didn’t break this ball when they returned it. That’s not to say that this is suitable as a chew toy, but under supervised games of fetch, it holds up to rough play. After hundreds of games of fetch, the Crazy Bounce only had a few teeth marks to show. I was actually impressed by how little damage the ball had. By this time, our larger dogs had seriously damaged the other dog tennis balls. 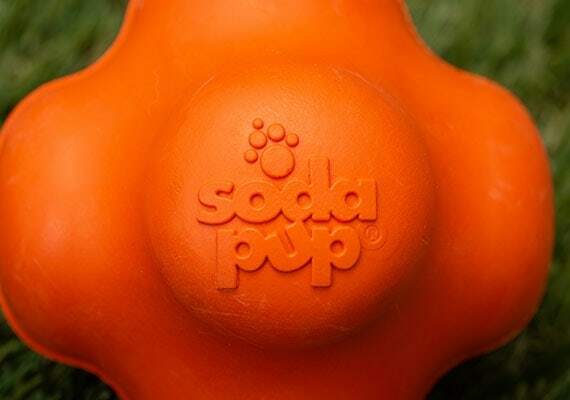 SodaPup is another USA-based company that manufacturers its toys right here on American soil. The materials used are FDA-compliant, veterinary-approved and will hold up to a dishwasher cycle once play time is over. Like with the other US brands we reviewed, they offer a replacement guarantee (up to 30 days) in the event the Crazy Bounce breaks. At 3 inches at the widest point, I could squeeze this in a large-sized ball thrower. However, I did have to use my hands. It was difficult to pick the Crazy Bounce off the ground using the ball thrower alone. The Crazy Bounce lives up to its name. Erratic, random bouncing. If that’s what you want in a ball, then it doesn’t get any better than this. 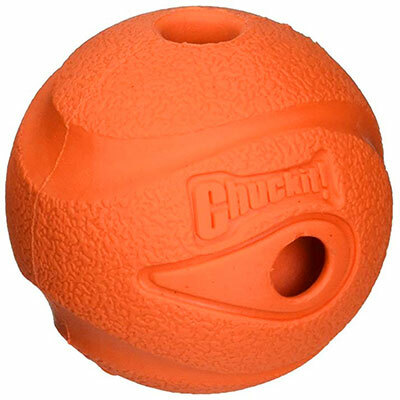 A heavy-duty squeaky ball that is as fun to fetch as it is to return. Let me be upfront… I recommend squeaky dog tennis balls with reservations because I noticed a pattern during testing. After chasing down a ball, dogs bit down on it and realized it squeaked. They became more interested in chewing on it than returning it, effectively ending the game. But if you really want a squeaky toy, then I can only recommend the Orbee-Tuff Squeak. 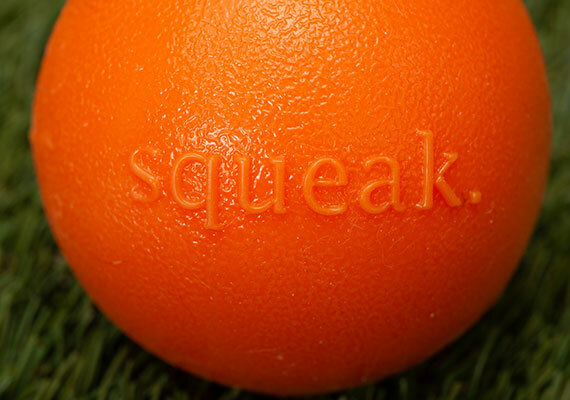 We were not surprised to see it outclass every other squeaky dog tennis ball we reviewed. Admittedly in this category, the bar was fairly low. 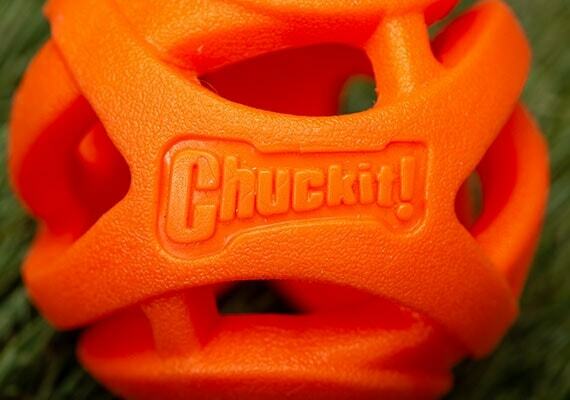 The Nerf and Kong bulk squeaky tennis balls were inconsistent in quality, and the Chuckit! 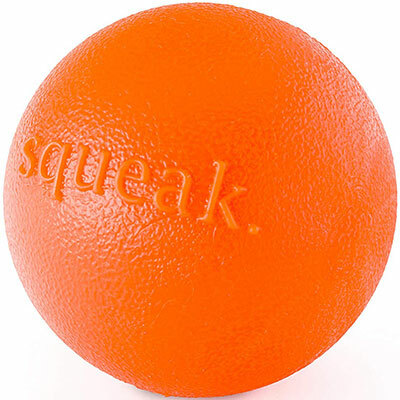 Ultra Squeak Balls had their squeaker broken within the first two hours of play. 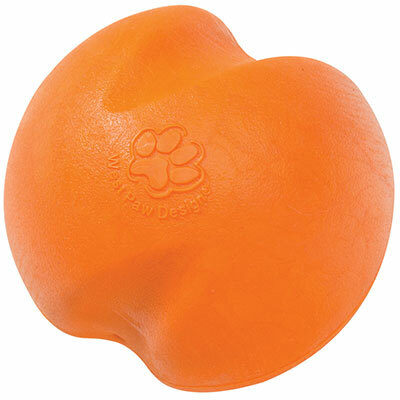 First and foremost, this is the most durable squeaky ball you will come across. If you have a chew monster for a pet, like a Rottweiler, then nothing else will hold up as well. Again, this isn’t indestructible, but it’s as hard-wearing as it gets for supervised play. This is another dog toy made right here in the USA. As you expect from anything American-made, this ball oozes quality. It’s made from a non-toxic FDA-compliant rubber and is even dishwasher-safe for easy cleaning. Interestingly, the ball is infused with mint oil. I noticed that this made the ball easier for our dogs to find, particularly when sniffing around for it in long grass. Unfortunately, all this comes at a price. Like the West Paw Jive, this is one of the most expensive tennis ball alternatives on the market. But included in the price is a replacement guarantee. At the time of writing, Planet Dog will replace the toy once in the event it fails. While this makes the price more appealing, you will cringe if you are on a tight budget. But the main reason you are buying this dog tennis ball over any other is the squeaker. As you would expect from a heavy duty ball, it takes a little more pressure to make it squeak than say a plush toy. However, even our small Jack Russell made the ball to squeak. The ball only comes in a single size. At 3 inches, it’s just bigger than a standard tennis ball. This makes it too large for a medium-sized ball thrower. 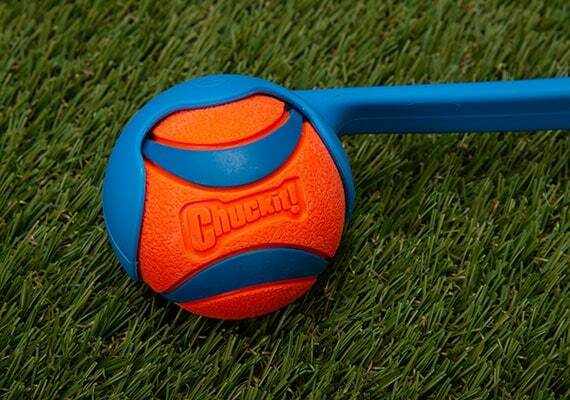 However, we had no issues using a large Chuckit! to pick up and launch the ball across the park. Again, I recommend squeaky tennis balls with reservations. But if a squeaker is an essential feature for you, then this is as good as it gets. For everyone else, check out my next recommendation – it makes noise but only when you throw it! A bouncy ball that makes a whistling sound when thrown. 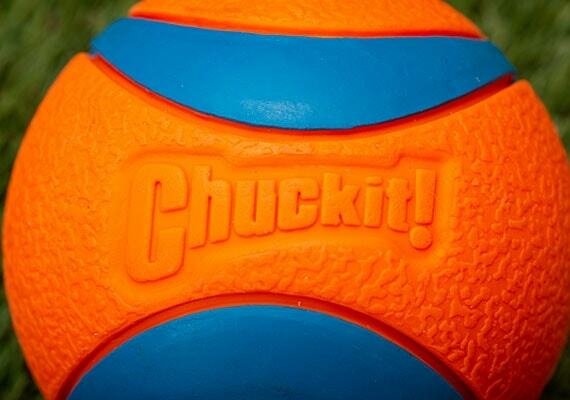 Few balls were chased with as much enthusiasm as the Chuckit! Whistler Ball. Located around the ball are four holes. 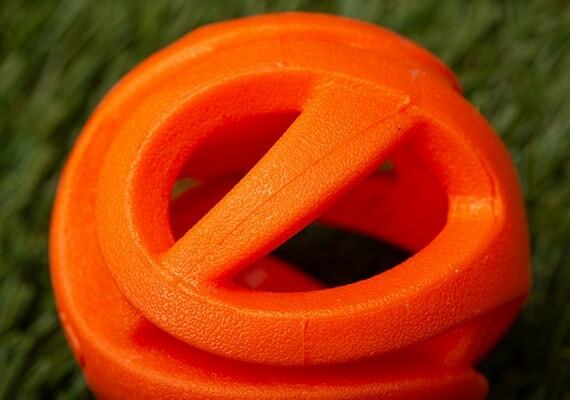 Two go right through the center so that your dog can breathe with the ball in his mouth. But it’s the other two holes that give the Whistler Ball its name. When thrown, air passes over these holes and makes a distinct whistling sound. How loud this sound is entirely depends on the force you throw it with. The harder you throw, the louder the whistle. Now, I must mention that soft throws, say underhand tosses inside or short ones in the back yard, didn’t make any noise at all. The ball simply didn’t travel fast enough to make a whistling sound. But where this ball really shines is in a wide, open field. When loaded into my ball thrower and launched, I could hear the whistle from over 100 feet away. When testing, we had a German Shorthaired Pointer that would run ahead before the ball was even thrown. Unfortunately, this behavior meant that she lost track of a few balls as they flew past her head from behind. Thanks to the whistling sound, however, she was able to easily locate this ball throw after throw. 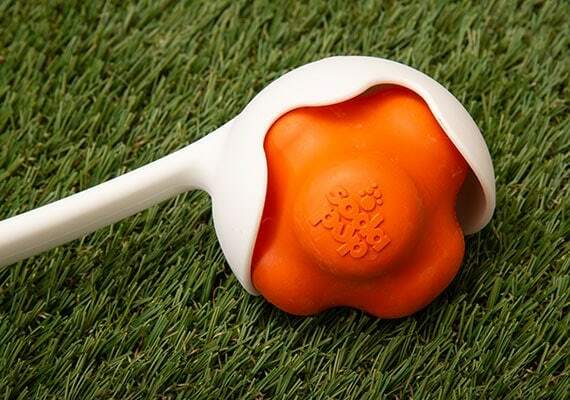 If you are tired of walking over to balls that your dog can’t find, then this could be the solution for you. With that said, it’s not a particularly loud whistle. But you have to remember that dogs have incredibly sensitive hearing. I experimented by moving the ball back and forth at a speed to make the softest whistle possible. While I could barely hear it, my dog in the other room came running. The Whistler Balls come in a two pack, one orange and the other blue. While we found the orange ball easier to locate under shrubs and in long grass, our dogs appeared to find the blue one easier. Still, it’s nice to have a spare on hand – balls are like pens, they always go missing. Now, the holes have a drawback. If you throw this ball in a pool, river or lake, it’s going to sink like a rock. Stick to open fields instead. Quality wise, the ball is made from a heavy-duty rubber that bounces high. After hundreds of games of fetch, besides a few scratches, it hardly showed signs of wear. Even so, the only reason to choose this ball over any other on our list is because of its whistling sound. The Whistler Ball is a great alternative to a squeaky dog tennis ball. And since it won’t make noise when it’s in your dog’s mouth, he will be more likely to return it. Highly recommended! Let’s face it… A ball is a basic dog toy. Truth be told, any tennis ball you buy can get the job done. 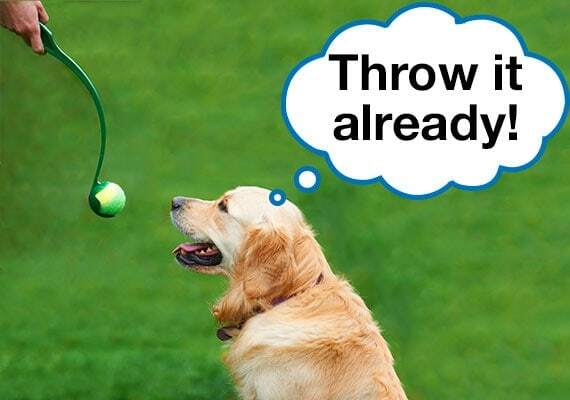 After all, if you can throw it and your dog can bring it back, then it works, right? With that said, not every ball can be a winner. While our top picks outperformed, the following dog tennis balls fell short in one way or another. Now, this doesn’t necessarily mean that these are bad dog tennis balls. Some put up a great fight and were only just edged out by our top picks. Others were much more flawed. However, based on our testing, we see little reason to choose these over our recommendations above. For indoor play, the StarMark Durafoam Ball was great. It’s soft, not too bouncy and surprisingly durable at a reasonable price. If you only play games of fetch in your living room, then there is a lot to love about this ball. But outside, it can’t be thrown as far and doesn’t bounce as high as our recommendations above. The Nerf UltraPlush Trackshot, on the other hand, was much less suitable. At 4½ inches, these are too large for small dogs and more expensive than most other balls we reviewed. The Chuckit! Strato Ball has a hole in the center to cut down on weight and bounces higher than any other ball we tested. Unfortunately, the claim of floating higher doesn’t ring true. 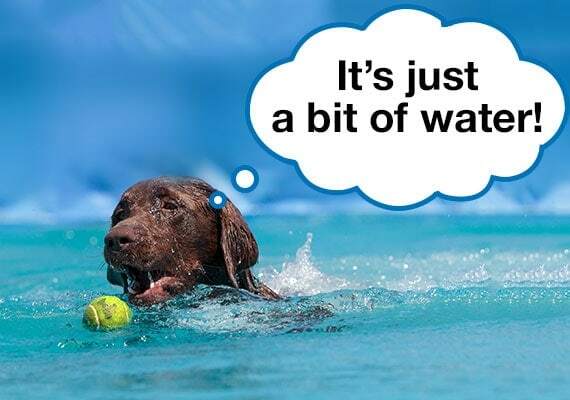 Due to the hole, the ball sits lower in the water, making it more difficult for a dog to see while swimming. They are also more expensive than our number one pick. The Chuckit! Erratic Ball promises a random bounce when it lands, forcing your dog to change directions mid-chase. When playing on grass, we hardly noticed any change in the ball’s direction after bouncing. 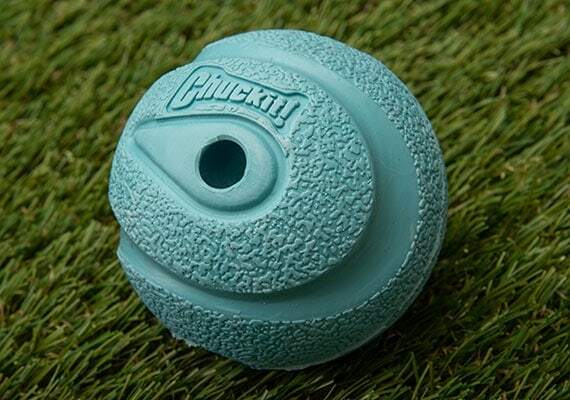 It only fits in a ball launcher in a specific direction, and the green color made it more difficult to find in tall grass. 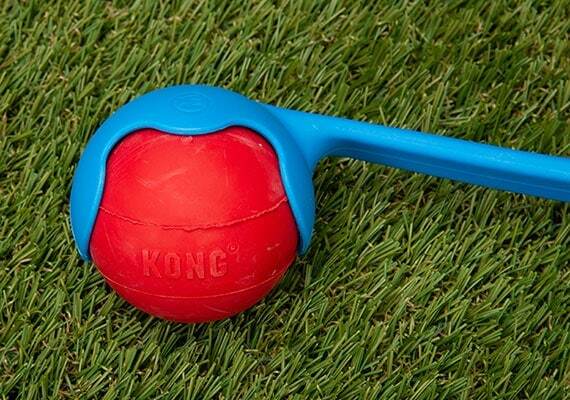 The Kong Ball Dog Toy is a big, heavy rubber ball. Even with two holes and a hollow core to reduce the weight, this thing is solid. While it’s certainly durable and would hold up to the powerful jaws of a German Shepherd, I’d be concerned if this ball hit your pup on the snout. Not a good choice for dogs that catch balls on the run. And, it’s definitely not suitable for indoor use. It was firm and heavy enough that our smallest tester had no interest in it. 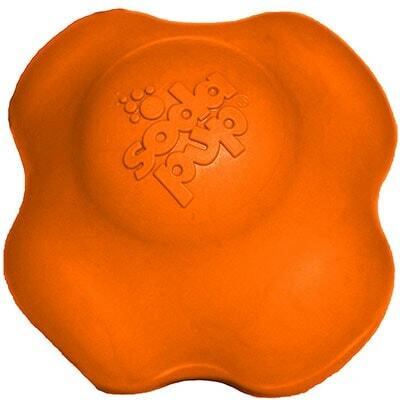 The Kong Rubber Ball Extreme was a more durable version of the one above. It has the same problems at a higher price. 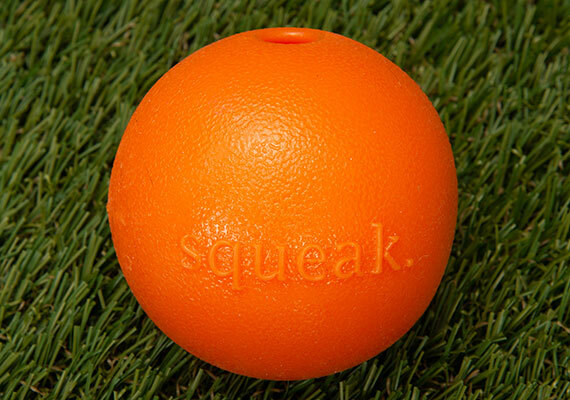 The JW Pet iSqueak was one of the few dog tennis balls to break during our review. The squeaker died within the first fetch session, and then a noticeable split appeared shortly after. The Ethical Pets Super Safe Silicone Ball was another ball that soon broke during testing and is a prime example of why you don’t see many silicone dog balls on the market. Squeaky dog tennis balls, like those from Hyper Pet or the Kong Squeak Air, were appealing as they could be bought in bulk at an affordable price. However, the quality differed dramatically even in the same package. Some were too hard, while others easily split. And, they still have the tennis ball fuzz that can be peeled off. Not recommended. Finally, we tested all the major tennis ball brands including Penn, Wilson, Dunlop, Gamma and Slazenger. When throwing in the local dog park, I couldn’t tell a difference between hard court versus all-surface tennis balls. As you would expect, all were consistently good quality. In fact, the difference in quality compared to the generic balls we picked up from the dollar store and our local Petco was astounding. If you want to stick to the tried-and-true tennis ball, then we only recommend buying these name-brand balls because you are guaranteed a quality tennis ball. However, they still don’t address the concerns outlined earlier in the article in that they can be harmful to dogs. If you made it this far, congratulations! 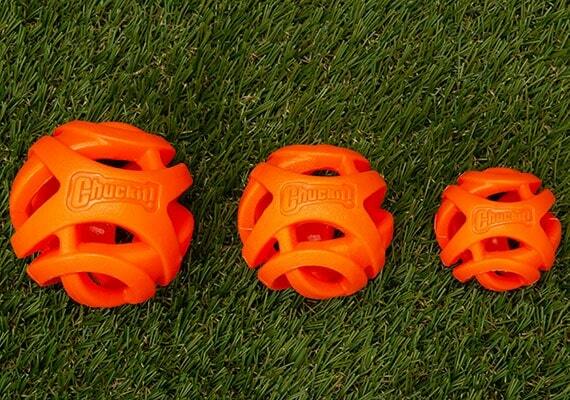 You now know which tennis ball is ideal for your dog. 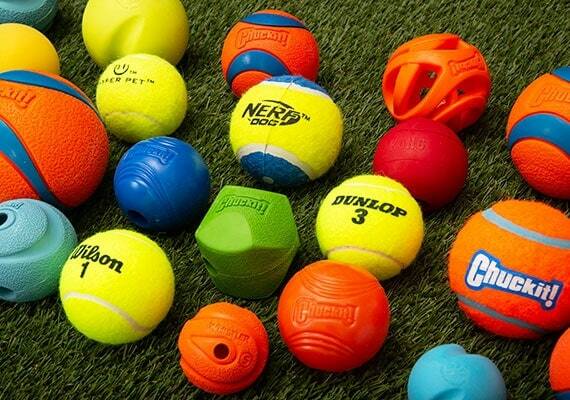 Which tennis ball do you use to play with your pooch? Let me know in the comments below!